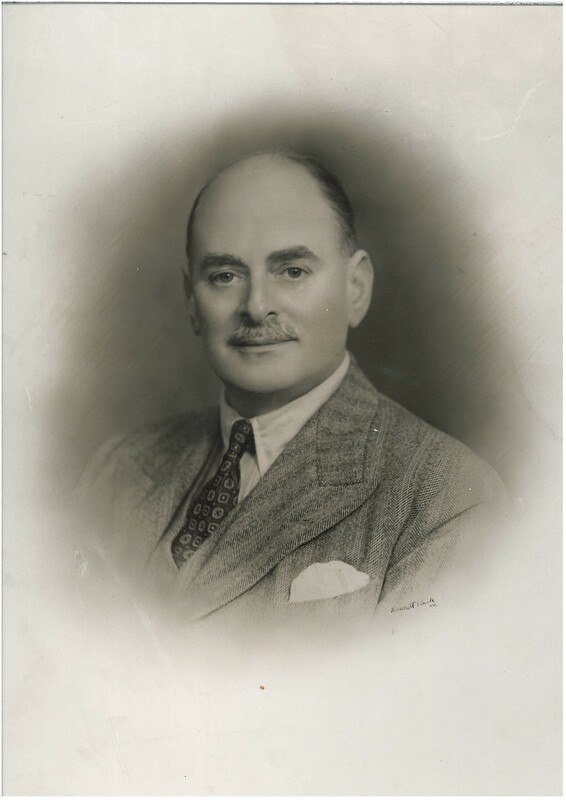 Wilfrid Edwards wrote a series of letters to a young Wolverhampton lady, Lilian Wiggall, while he was posted abroad. Although it appears that not all of the letters have survived (earlier non-extant letters are referred to), the surviving letters date between 8 November 1916 and 5 November 1917, giving a fascinating view of life at the Front, as well as an insight into two people’s relationship. Scans and full transcriptions of all the letters are available on Flickr, but some of the highlights include “I often think that if I had of a stopped in Wolverhampton we should of a perhaps become…more than mere friends of course you may think different.” Whilst we do not have Lilian’s responses, the fact that she clearly kept sending letters, postcards and parcels indicates that the feelings were mutual. The fact that the letters have survived to this day is also an indication that they must have held cherished memories for Lilian. As well as asking Lilian about herself, Edwards also gives details about his daily life, such as “I dont no what you would say if you were to see me like I am dressed now. We do not look like soldiers, look more like rag time rag pickers.” He also clearly misses Wolverhampton, as he asks questions such as (at Christmas 1916) “what is the Panto at the grand this time” (obviously referring to the Grand Theatre). The National Archives have got Edwards’s World War One Pension records, so we may feature him again on a future blog. In the meantime, we have some background information on him. He was born in Wolverhampton on 18 December 1888. By the 1911 census, he is a 22-year old boarder at No 2 Pittsburgh Place, Beach Street, Birmingham, living with hairdresser Richard Gair, his wife Lucy, and son William Richard Gair (an office boy). He is an iron moulder. Having enlisted on the 15 December 1915, Edwards was a member of the 5th Platoon, B company, 1st Gloucesters, and was stationed with the British Expeditionary Force in France. When he terminated his service, his home address was given as 52 Ewins Street, Wolverhampton. In the last surviving letter, dated 5 November 1917, Edwards speaks of his forthcoming leave, and makes plans to visit Lilian, saying “dont think I want to monoplise [sic] you [sic] time.” He suggests meeting her at Snow Hill or New Street station in Birmingham. During the final months of the First World War, Harold Bantock Sankey applied for release from military service for a period of six months to enable him to service as acting Director of Joseph Sankey & Sons Ltd.
Sankey joined the Army in August 1914, and served in France, Belgium and Italy. From March 1915 onwards, he was at the Front, including participating in the Battle of the Somme in 1916. He also took part in the third Battle of Ypres in 1917. At the time of his application for release he was Lieutenant Acting Captain in the Royal Field Artillery Territorial B. Battery, 241st Brigade. His medal card can be found at the National Archives. Wolverhampton City Archives has a collection of material relating to his application for release. The grounds for his application was due to the urgent and important nature of the work done at that time by Joseph Sankey and Sons, Limited. The Chairman of the Company, John William Sankey, had died in 1914, and his eldest son Sydney had been killed in action in 1915. Out of the two Managing Directors of the Company (both of whom were over military age), one of them, Fred E. Sankey, had been ordered to take a prolonged rest from business. Despite this insufficient management presence, the company was producing mines, metal fittings for aircraft and steel helmets in vast quantities, assisting the war effort in a number of of areas. Hence the company felt that it was vital that “a young and active man should concentrate upon [this area] and relieve the strain on the present depleted Directing Staff.” (Harold Sankey was 23 at the time). However, gaining release from active service was not a straightforward matter. In December 1917, the solicitor George Thorne wrote to Mr Sankey, stating that “for the most part, the military authorities find the men of experience the most useful to them and will not let them go so long gas they can hold them.” Clearly, it would not, therefore be enough to state the case of Sankey’s already worthwhile contribution. In August 1918, Mr Sankey received a letter from a Nathaniel Martin, stating that “no such application must be made by the Ministry to the War Office on behalf of an officer under 25 years of age.” Martin did state that Captain Sankey could perhaps approach the War Office directly to obtain a temporary release. Finally in October 1918, against all the odds, Captain Sankey’s application for release was approved for six months. Given the war ended a month later, hindsight would suggest that this was perhaps immaterial, but it does indicate that the importance placed on the work of the Sankey company during this time. 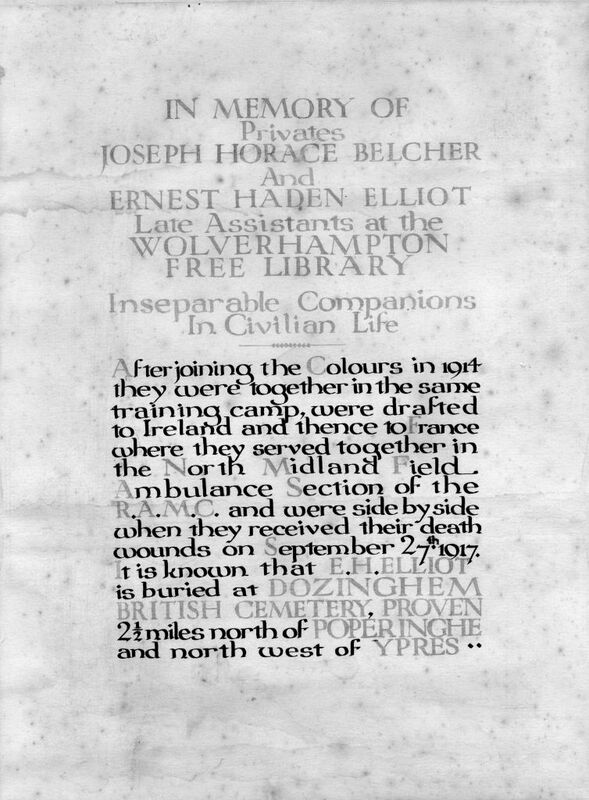 This notice was produced by Wolverhampton Free Library after the unfortunate death of two of their Library Assistants on 27 September 1917, Joseph Horace Belcher and Ernest Haden Elliott. Belcher was born in 1896 to Joseph and Mary Ann Belcher, of 247 All Saints Road, Wolverhampton. He attended the Wolverhampton Higher Grade School. By the 1911 census he was an errand boy at an iron monger’s shop, but later became a Library Assistant at the Wolverhampton Free Library. He enlisted on 7 October 1914 and served in the North Midland Field Ambulance Section of the Royal Army Medical Corps as a Private (service number 421194). He received the Victory Medal and the British Medal. He was killled on the Western Front in France, part of the British Expeditionary Force there, and is buried at Tyne Cot in West Vlanderen, Belgium. Belcher is commemorated on three war memorials in Wolverhampton, that of the Higher Grade School in Newhampton Road, the Royal Army Medical Corps Transport Memorial in St Peter’s Church and All Saints Church War Memorial. 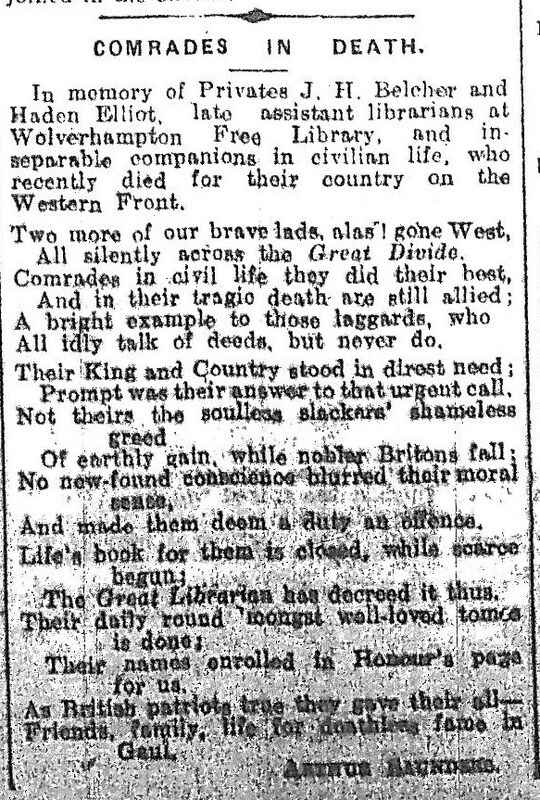 There was also a poem, written by Arthur Saunders, published in the Express and Star on 23 October 1917. The Royal Army Medical Corps also have an entry for him on their website. Belcher’s service records, available on Ancestry, include a query from his father about his personal effects. In particular, it appears that Belcher’s watch was not amongst those items sent back to the family, and they had instead received a watch that did not belong to him. The response from the commander of Belcher’s unit states that “No personal effects of this man were handed over to this Unit. I believe he was killed in No Man’s land.” It appears, however, that the watch was eventually tracked down, as there is a postcard dated 1 May 1918 from Mr Belcher, thanking the Royal Army Medical Corps for the return of the watch. The research for this blog post was conducted by one of our volunteers, Elizabeth Stenning. This is the fourth report from our volunteer, Frank Lockley, on the soldiers buried at Heath Town Cemetary. Buried 25th March 1918 age 39. Grave ref. new ground 34/10. 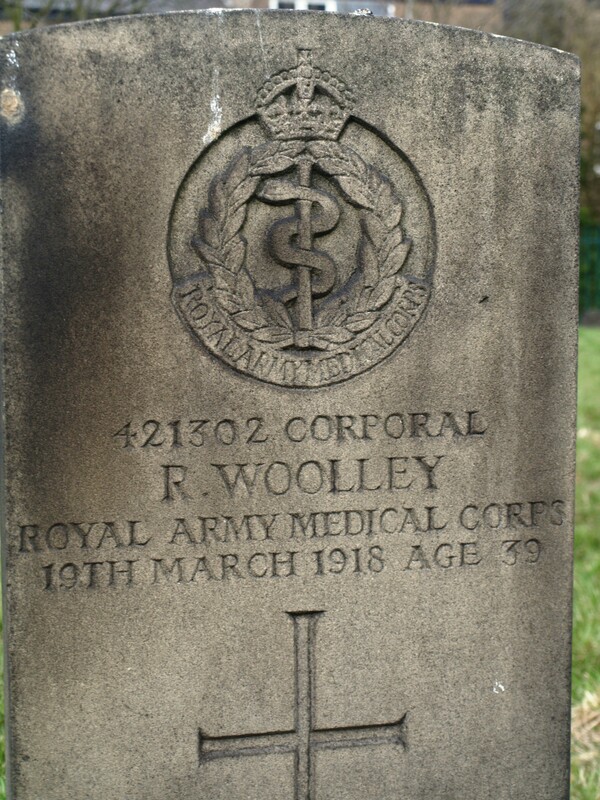 Richard Woolley was born in 1879 in Heath Town, son of Richard and Sarah. 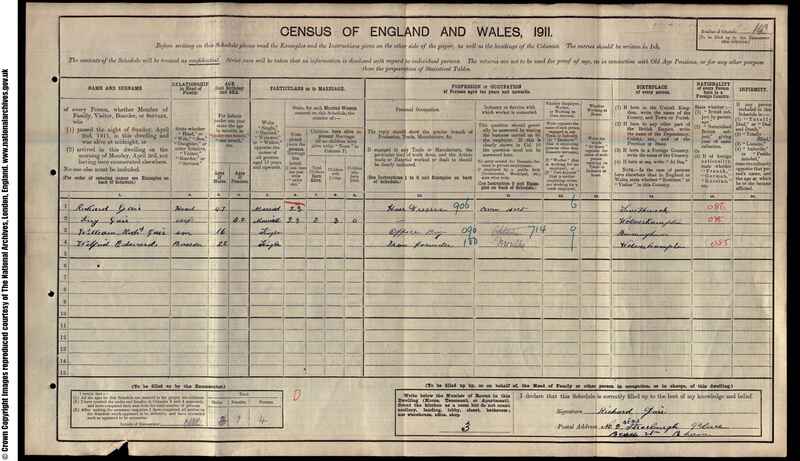 He married Mary Whitehouse in 1903 and at the time of the 1911 census they are living in Stafford with two daughters, Muriel and Edna. Richard is working as an electrical fitter. He enlists with the Territorial Force on 15th October 1914 and is posted to the Royal Army Medical Corps, 3rd North Midland Field Ambulance . He is soon promoted to Corporal and in June 1915 he is released to civil employment in an armoury. According to the medical papers in his service record he fell ill on 17th March 1918 and died just two days later in the General Hospital. His death certificate describes his occupation as “machine tool fitter at Ordnance Works” and cause of death “Acute Transverse Myelitis”. His medical report states that “It is not possible to state how far the disease causing his death had anything to do with the military service”.